Video games can help us experience things that never happen in real life, and barring some worst case scenario climate catastrophe, humankind will never know what it's like to see whales fall out of the sky. Until now. 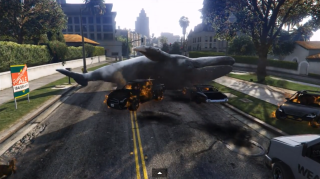 Using GTA 5 trainer Script Hook, YouTuber Merfish has created a helpful video demonstrating what can happen if whales start falling out of the sky. Things explode, inevitably, but interestingly enough sometimes they just bounce back from whence they came, which is weird and probably not realistic at all. Script Hook is a useful little tool if you want to try your hand at tweaking GTA 5. We've collected some cool Script Hook videos for your viewing pleasure.